As soon as I started this book I was hooked. I have a thing for books that are set in the London Season, and so 'The Falconer' had an advantage right from the very beginning. The story starts out in a ballroom, and we find out that the main character, Aileana, is rumored to have killed her mother, though of course it's not true. However, it is true that she's a murderer, and we get a glimpse of her dark side, as well as her killing a faerie, in the first chapter itself. The pace of the book is quick, and there was action at almost every moment. Perhaps that is one of the reasons I ended up reading this book through the night, I just had to find out what would happen at the end. As it turns out, the end wasn't satisfying in the least, and instead evokes more questions and leaves us with only more questions. That was one of the things that annoyed me most about the book: the ending. I just did not like it, whether because of the fact that it ended in between a battle to save the city, or because it wasn't as intense as I'd hoped it to be. Right or wrong, that's definitely one of the reasons I'm giving this novel a lower rating than I would have otherwise. Aileana was an amazing heroine, if a bit unprepared. Ever since her mother was killed, she had been aching for revenge. However, instead of blindly going after it, she put her friends first. I also liked how she did her best to not keep secrets, especially from her friend Catherine. I've grown so used to main characters protecting their friends by hiding the truth that it was nice to see a change. The fact that Aileana loved the fighting and beat the seductive Kiaran is just another reason I love her so. One of my favorite things about her is how vulnerable she is, especially around Kiaran, but also Gavin. This encouraged a lot of swoon-worthy moments, and despite the fact that these moments didn't always come to fruition, at least I got to swoon, right? I am hands down a Kiaran girl (unless the next book will throw some other hot faerie at me...?). The plot started out with Aileana wanting to avenge her mother's death, and then getting addicted to killing fairies. Then, like the title suggests, Aileana being a falconer is what takes up a large part of the story, and the whole saving the city thing comes into play. I suppose one good ting about the ending is that it deviates from the cliché that the heroine or hero will always beat the bad guys. With an ending like this, the next book could have Kiaran becoming Aileana's enemy, Aileana being captured, etc. There is no limit to all the bad things that could happen. Interesting enough as the potential is in the next book, I'm not sure if I'll continue with the series. This book kept my attention until the end, but I'm not sure I'm interested in the predicament the author left the characters at. That's probably the real reason I didn't like the ending of this book. 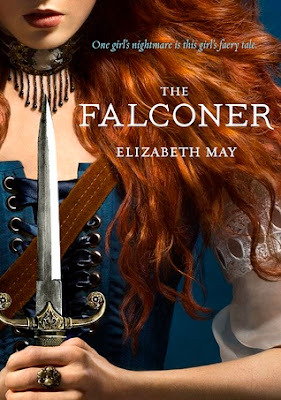 'The Falconer' is an engaging start to the series, and it sequences a young girl learning to live with the circumstances of her mother's death, her status as a falconer, and really just trying to find her place in a world that would never understand who or what she really is. It's a paranormal romance mixed in with steampunk, and fans of the latter - as well as of faeries - should try this book out. 'The Falconer' is a great book, even though the series probably won't end up being one of my favorites. Book Synopsis: Heiress. Debutant. Murderer. A new generation of heroines has arrived. Source: Borrowed the hardcover from the library.